Organized religion played a major role in the settling of Illinois and continues to influence the culture of our region. We highlight two places of worship, one in the country and one in the city. he oldest organized church in Lake County was established in 1838, by 16 residents of what was then Mechanics Grove, and later Ivanhoe. Led by the Rev. John Blanchard, who traveled three days from Chicago to reach the settlement along the Des Plaines River, the residents drafted a charter and articles of faith. The congregants met in each other’s log homes and in schools until the church was built, in 1856. The children of the attending families did extra chores to purchase a bell. A cemetery, still on the property, was established just west of the building. Membership ebbed and flowed with the changing periods of the country’s development, influenced by new settlements, industrial growth, wars and economic hardship. The little church persevered, and during the early 1900s, efforts included constructing a buggy shed, digging a basement and adding on a kitchen, along with extensively remodeling the interior of the church. In 1952, a parsonage was built, and in 1957, a school. The building was placed on the National Register of Historic Places in 1973. Today, as part of the United Church of Christ, members are led by the Rev. Kristopher Hewitt, pastor. Worship services are held on Sunday at 10 a.m., and September through May, Sunday School starts at 9 a.m.
his parish was organized in 1841 by a small group of German immigrants, newly arrived from the Eifel region of the Rhineland. They were joined the following year by other immigrants from the same area. The group built its first church that same year, a log cabin on the site of the present church, which also served as a school and town meeting hall. 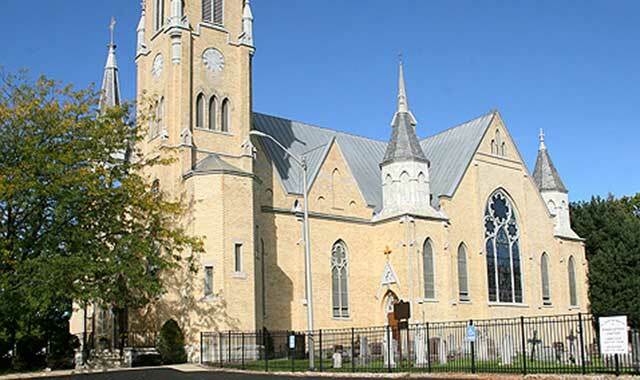 From 1842 to 1852, the parishioners of St. John’s were served by visiting priests sent from the diocesan headquarters at Vincennes, Ind., to administer the sacraments to Catholics in northern Illinois and Wisconsin. Settlers from other communities, without the services of a parish priest, came to St. John’s. In 1850, a larger frame church was built, which served the parish for 18 years. By then, membership had grown to such an extent that a third church was required. Construction began in 1867 and took 13 years to complete. The Gothic-style building was the pride of Johnsburg until 1900, when it was completely destroyed by fire. The present church was completed in 1902, and some of the beautiful stained glass windows were brought over from Germany. The steeples and towers are decorated with floral finials and topped off with ornate crucifixes. The main steeple, rising 159 feet, has gargoyle water spouts and houses a working belfry. The bells, with their original wood cartwheels still attached, are dated 1900, and were cast in St. Louis specifically for St. John’s. They are rung on a daily basis. Today’s congregation is led by the Rev. Jacek Junak, C.R., pastor. Mass is held on Sunday at 7, 9 and 11 a.m., Monday-Friday at 8 a.m. and Saturday at 4 p.m. This entry was posted on Wednesday, November 26th, 2014 at 11:59 am	and is filed under Mind & Spirit. You can follow any responses to this entry through the RSS 2.0 feed. Both comments and pings are currently closed.